New Year 2014Videoconference with Students in India! 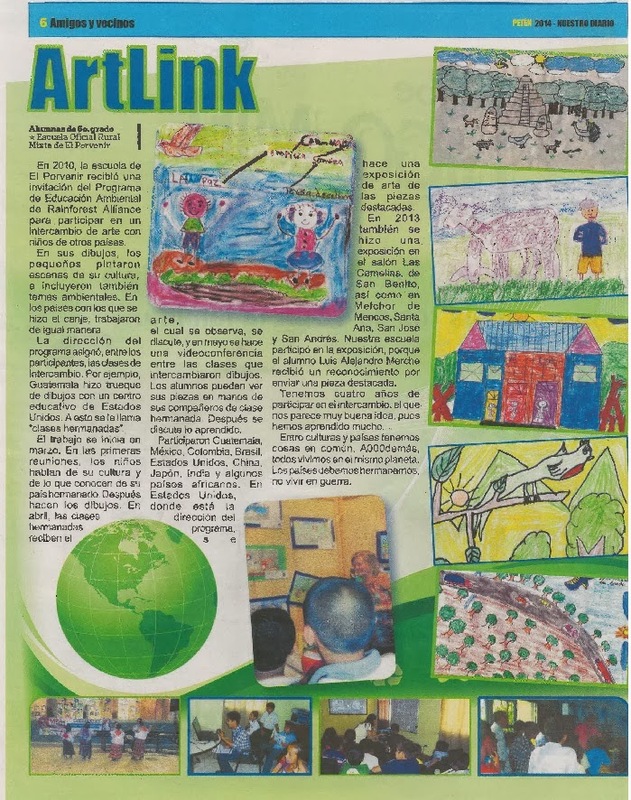 This article about our Rainforest ArtLink program was featured in a local paper created by a partner teacher, Ms. Lesbia Bedoya from Escuela Oficial Rural Mizta El Porvenir in Peten, Guatemala. The title of the newspaper is El Chispazo which roughly translates to igniting. Ms. Bedoya had started this as a local home-grown community newspaper and then entered it into a national competition to have it produced, published and distributed on a national level. She won! Rainforest ArtLink programs are featured in many articles throughout this wonderful paper. Four thousand newspapers were distributed to all the communities in the Peten region. We are honored to be a part of this exciting and award winning project. Congratulations to Ms. Lesbia Bedoya!